For the process of financing by venture capital, see Venture capital financing. A financing diagram illustrating how start-up companies are typically financed. First, the new firm seeks out "seed capital" and funding from "angel investors" and accelerators. Then, if the firm can survive through the "valley of death"–the period where the firm is trying to develop on a "shoestring" budget–the firm can seek venture capital financing. Venture capital (VC) is a type of private equity, a form of financing that is provided by firms or funds to small, early-stage, emerging firms that are deemed to have high growth potential, or which have demonstrated high growth (in terms of number of employees, annual revenue, or both). Venture capital firms or funds invest in these early-stage companies in exchange for equity, or an ownership stake, in the companies they invest in. Venture capitalists take on the risk of financing risky start-ups in the hopes that some of the firms they support will become successful. Because startups face high uncertainty, VC investments do have high rates of failure. The start-ups are usually based on an innovative technology or business model and they are usually from the high technology industries, such as information technology (IT), clean technology or biotechnology. The typical venture capital investment occurs after an initial "seed funding" round. The first round of institutional venture capital to fund growth is called the Series A round. Venture capitalists provide this financing in the interest of generating a return through an eventual "exit" event, such as the company selling shares to the public for the first time in an initial public offering (IPO) or doing a merger and acquisition (also known as a "trade sale") of the company. In addition to Angel investing, equity crowdfunding and other seed funding options, venture capital is attractive for new companies with limited operating history that are too small to raise capital in the public markets and have not reached the point where they are able to secure a bank loan or complete a debt offering. In exchange for the high risk that venture capitalists assume by investing in smaller and early-stage companies, venture capitalists usually get significant control over company decisions, in addition to a significant portion of the companies' ownership (and consequently value). Start-ups like Uber, Airbnb, Flipkart, Xiaomi & Didi Chuxing are highly valued startups, commonly known as unicorns, where venture capitalists contribute more than financing to these early-stage firms; they also often provide strategic advice to the firm's executives on its business model and marketing strategies. Venture capital is also a way in which the private and public sectors can construct an institution that systematically creates business networks for the new firms and industries, so that they can progress and develop. This institution helps identify promising new firms and provide them with finance, technical expertise, mentoring, marketing "know-how", and business models. Once integrated into the business network, these firms are more likely to succeed, as they become "nodes" in the search networks for designing and building products in their domain. However, venture capitalists' decisions are often biased, exhibiting for instance overconfidence and illusion of control, much like entrepreneurial decisions in general. Before World War II (1939–1945), money orders (originally known as "development capital") remained primarily the domain of wealthy individuals and families. Only after 1945 did "true" private equity investments begin to emerge, notably with the founding of the first two venture capital firms in 1946: American Research and Development Corporation (ARDC) and J.H. Whitney & Company. Georges Doriot, the "father of venture capitalism" (and former assistant dean of Harvard Business School), founded the graduate business school INSEAD in 1957. Along with Ralph Flanders and Karl Compton (former president of MIT), Doriot founded ARDC in 1946 to encourage private-sector investment in businesses run by soldiers returning from World War II. ARDC became the first institutional private-equity investment firm to raise capital from sources other than wealthy families, although it had several notable investment successes as well. ARDC is credited[by whom?] with the first trick when its 1957 investment of $70,000 in Digital Equipment Corporation (DEC) would be valued at over $355 million after the company's initial public offering in 1968 (representing a return of over 1200 times on its investment and an annualized rate of return of 101%). Former employees of ARDC went on to establish several prominent venture-capital firms including Greylock Partners (founded in 1965 by Charlie Waite and Bill Elfers) and Morgan, Holland Ventures, the predecessor of Flagship Ventures (founded in 1982 by James Morgan). ARDC continued investing until 1971, when Doriot retired. In 1972 Doriot merged ARDC with Textron after having invested in over 150 companies. John Hay Whitney (1904–1982) and his partner Benno Schmidt (1913–1999) founded J.H. Whitney & Company in 1946. Whitney had been investing since the 1930s, founding Pioneer Pictures in 1933 and acquiring a 15% interest in Technicolor Corporation with his cousin Cornelius Vanderbilt Whitney. Florida Foods Corporation proved Whitney's most famous investment. The company developed an innovative method for delivering nutrition to American soldiers, later known as Minute Maid orange juice and was sold to The Coca-Cola Company in 1960. J.H. Whitney & Company continued to make investments in leveraged buyout transactions and raised $750 million for its sixth institutional private equity fund in 2005. One of the first steps toward a professionally managed venture capital industry was the passage of the Small Business Investment Act of 1958. The 1958 Act officially allowed the U.S. Small Business Administration (SBA) to license private "Small Business Investment Companies" (SBICs) to help the financing and management of the small entrepreneurial businesses in the United States. During the 1950s, putting a venture capital deal together may have required the help of two or three other organizations to complete the transaction. It was a business that was growing very rapidly, and as the business grew, the transactions grew exponentially. During the 1960s and 1970s, venture capital firms focused their investment activity primarily on starting and expanding companies. More often than not, these companies were exploiting breakthroughs in electronic, medical, or data-processing technology. As a result, venture capital came to be almost synonymous with technology finance. An early West Coast venture capital company was Draper and Johnson Investment Company, formed in 1962 by William Henry Draper III and Franklin P. Johnson, Jr. In 1965, Sutter Hill Ventures acquired the portfolio of Draper and Johnson as a founding action. Bill Draper and Paul Wythes were the founders, and Pitch Johnson formed Asset Management Company at that time. It is commonly noted that the first venture-backed startup is Fairchild Semiconductor (which produced the first commercially practical integrated circuit), funded in 1959 by what would later become Venrock Associates. Venrock was founded in 1969 by Laurance S. Rockefeller, the fourth of John D. Rockefeller's six children, as a way to allow other Rockefeller children to develop exposure to venture capital investments. It was also in the 1960s that the common form of private equity fund, still in use today, emerged. Private equity firms organized limited partnerships to hold investments in which the investment professionals served as general partner and the investors, who were passive limited partners, put up the capital. The compensation structure, still in use today, also emerged with limited partners paying an annual management fee of 1.0–2.5% and a carried interest typically representing up to 20% of the profits of the partnership. Throughout the 1970s, a group of private equity firms, focused primarily on venture capital investments, would be founded that would become the model for later leveraged buyout and venture capital investment firms. In 1973, with the number of new venture capital firms increasing, leading venture capitalists formed the National Venture Capital Association (NVCA). The NVCA was to serve as the industry trade group for the venture capital industry. Venture capital firms suffered a temporary downturn in 1974, when the stock market crashed and investors were naturally wary of this new kind of investment fund. It was not until 1978 that venture capital experienced its first major fundraising year, as the industry raised approximately $750 million. With the passage of the Employee Retirement Income Security Act (ERISA) in 1974, corporate pension funds were prohibited from holding certain risky investments including many investments in privately held companies. In 1978, the US Labor Department relaxed certain restrictions of the ERISA, under the "prudent man rule"[note 2], thus allowing corporate pension funds to invest in the asset class and providing a major source of capital available to venture capitalists. The public successes of the venture capital industry in the 1970s and early 1980s (e.g., Digital Equipment Corporation, Apple Inc., Genentech) gave rise to a major proliferation of venture capital investment firms. From just a few dozen firms at the start of the decade, there were over 650 firms by the end of the 1980s, each searching for the next major "home run." The number of firms multiplied, and the capital managed by these firms increased from $3 billion to $31 billion over the course of the decade. The growth of the industry was hampered by sharply declining returns, and certain venture firms began posting losses for the first time. In addition to the increased competition among firms, several other factors affected returns. The market for initial public offerings cooled in the mid-1980s before collapsing after the stock market crash in 1987, and foreign corporations, particularly from Japan and Korea, flooded early-stage companies with capital. In response to the changing conditions, corporations that had sponsored in-house venture investment arms, including General Electric and Paine Webber either sold off or closed these venture capital units. Additionally, venture capital units within Chemical Bank and Continental Illinois National Bank, among others, began shifting their focus from funding early stage companies toward investments in more mature companies. Even industry founders J.H. Whitney & Company and Warburg Pincus began to transition toward leveraged buyouts and growth capital investments. By the end of the 1980s, venture capital returns were relatively low, particularly in comparison with their emerging leveraged buyout cousins, due in part to the competition for hot startups, excess supply of IPOs and the inexperience of many venture capital fund managers. Growth in the venture capital industry remained limited throughout the 1980s and the first half of the 1990s, increasing from $3 billion in 1983 to just over $4 billion more than a decade later in 1994. After a shakeout of venture capital managers, the more successful firms retrenched, focusing increasingly on improving operations at their portfolio companies rather than continuously making new investments. Results would begin to turn very attractive, successful and would ultimately generate the venture capital boom of the 1990s. Yale School of Management Professor Andrew Metrick refers to these first 15 years of the modern venture capital industry beginning in 1980 as the "pre-boom period" in anticipation of the boom that would begin in 1995 and last through the bursting of the Internet bubble in 2000. 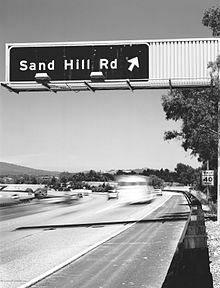 The late 1990s were a boom time for venture capital, as firms on Sand Hill Road in Menlo Park and Silicon Valley benefited from a huge surge of interest in the nascent Internet and other computer technologies. Initial public offerings of stock for technology and other growth companies were in abundance, and venture firms were reaping large returns. 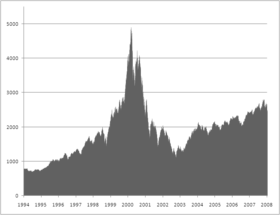 The technology-heavy NASDAQ Composite index peaked at 5,048 in March 2000 reflecting the high point of the dot-com bubble. The Nasdaq crash and technology slump that started in March 2000 shook virtually the entire venture capital industry as valuations for startup technology companies collapsed. Over the next two years, many venture firms had been forced to write-off large proportions of their investments, and many funds were significantly "under water" (the values of the fund's investments were below the amount of capital invested). Venture capital investors sought to reduce the size of commitments they had made to venture capital funds, and, in numerous instances, investors sought to unload existing commitments for cents on the dollar in the secondary market. By mid-2003, the venture capital industry had shriveled to about half its 2001 capacity. Nevertheless, PricewaterhouseCoopers' MoneyTree Survey shows that total venture capital investments held steady at 2003 levels through the second quarter of 2005. Although the post-boom years represent just a small fraction of the peak levels of venture investment reached in 2000, they still represent an increase over the levels of investment from 1980 through 1995. As a percentage of GDP, venture investment was 0.058% in 1994, peaked at 1.087% (nearly 19 times the 1994 level) in 2000 and ranged from 0.164% to 0.182% in 2003 and 2004. The revival of an Internet-driven environment in 2004 through 2007 helped to revive the venture capital environment. However, as a percentage of the overall private equity market, venture capital has still not reached its mid-1990s level, let alone its peak in 2000. Venture capital funds, which were responsible for much of the fundraising volume in 2000 (the height of the dot-com bubble), raised only $25.1 billion in 2006, a 2% decline from 2005 and a significant decline from its peak. Obtaining venture capital is substantially different from raising debt or a loan. Lenders have a legal right to interest on a loan and repayment of the capital irrespective of the success or failure of a business. Venture capital is invested in exchange for an equity stake in the business. The return of the venture capitalist as a shareholder depends on the growth and profitability of the business. This return is generally earned when the venture capitalist "exits" by selling its shareholdings when the business is sold to another owner. Venture capitalists are typically very selective in deciding what to invest in, with a Stanford survey of venture capitalists revealing that 100 companies were considered for every company receiving financing. Ventures receiving financing must demonstrate an excellent management team, a large potential market, and most importantly high growth potential, as only such opportunities are likely capable of providing financial returns and a successful exit within the required time frame (typically 3–7 years) that venture capitalists expect. Because there are no public exchanges listing their securities, private companies meet venture capital firms and other private equity investors in several ways, including warm referrals from the investors' trusted sources and other business contacts; investor conferences and symposia; and summits where companies pitch directly to investor groups in face-to-face meetings, including a variant known as "Speed Venturing", which is akin to speed-dating for capital, where the investor decides within 10 minutes whether he wants a follow-up meeting. In addition, some new private online networks are emerging to provide additional opportunities for meeting investors. This need for high returns makes venture funding an expensive capital source for companies, and most suitable for businesses having large up-front capital requirements, which cannot be financed by cheaper alternatives such as debt. That is most commonly the case for intangible assets such as software, and other intellectual property, whose value is unproven. In turn, this explains why venture capital is most prevalent in the fast-growing technology and life sciences or biotechnology fields. If a company does have the qualities venture capitalists seek including a solid business plan, a good management team, investment and passion from the founders, a good potential to exit the investment before the end of their funding cycle, and target minimum returns in excess of 40% per year, it will find it easier to raise venture capital. There are typically six stages of venture round financing offered in Venture Capital, that roughly correspond to these stages of a company's development. Seed funding: The earliest round of financing needed to prove a new idea, often provided by angel investors. Equity crowdfunding is also emerging as an option for seed funding. Growth (Series A round): Early sales and manufacturing funds. This is typically where VCs come in. Series A can be thought of as the first institutional round. Subsequent investment rounds are called Series B, Series C and so on. This is where most companies will have the most growth. Second-Round: Working capital for early stage companies that are selling product, but not yet turning a profit. This can also be called Series B round and so on. Exit of venture capitalist: VCs can exit through secondary sale or an IPO or an acquisition. Early stage VCs may exit in later rounds when new investors (VCs or Private Equity investors) buy the shares of existing investors. Sometimes a company very close to an IPO may allow some VCs to exit and instead new investors may come in hoping to profit from the IPO. Bridge Financing is when a startup seeks funding in between full VC rounds. The objective is to raise smaller amount of money instead of a full round and usually the existing investors participate. Between the first round and the fourth round, venture-backed companies may also seek to take venture debt. A venture capitalist is a person who makes venture investments, and these venture capitalists are expected to bring managerial and technical expertise as well as capital to their investments. A venture capital fund refers to a pooled investment vehicle (in the United States, often an LP or LLC) that primarily invests the financial capital of third-party investors in enterprises that are too risky for the standard capital markets or bank loans. These funds are typically managed by a venture capital firm, which often employs individuals with technology backgrounds (scientists, researchers), business training and/or deep industry experience. A core skill within VC is the ability to identify novel or disruptive technologies that have the potential to generate high commercial returns at an early stage. By definition, VCs also take a role in managing entrepreneurial companies at an early stage, thus adding skills as well as capital, thereby differentiating VC from buy-out private equity, which typically invest in companies with proven revenue, and thereby potentially realizing much higher rates of returns. Inherent in realizing abnormally high rates of returns is the risk of losing all of one's investment in a given startup company. As a consequence, most venture capital investments are done in a pool format, where several investors combine their investments into one large fund that invests in many different startup companies. By investing in the pool format, the investors are spreading out their risk to many different investments instead of taking the chance of putting all of their money in one start up firm. Venture capital firms are typically structured as partnerships, the general partners of which serve as the managers of the firm and will serve as investment advisors to the venture capital funds raised. Venture capital firms in the United States may also be structured as limited liability companies, in which case the firm's managers are known as managing members. 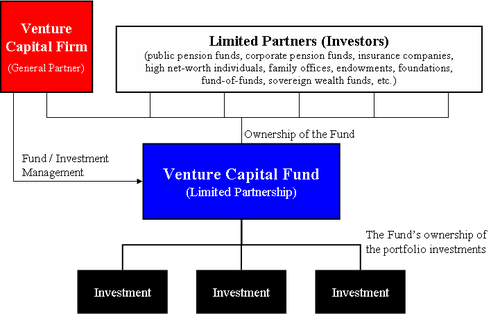 Investors in venture capital funds are known as limited partners. This constituency comprises both high-net-worth individuals and institutions with large amounts of available capital, such as state and private pension funds, university financial endowments, foundations, insurance companies, and pooled investment vehicles, called funds of funds. Venture capitalist firms differ in their motivations and approaches. There are multiple factors, and each firm is different. Business situation: Some VCs tend to invest in new, disruptive ideas, or fledgling companies. Others prefer investing in established companies that need support to go public or grow. Some invest solely in certain industries. Some prefer operating locally while others will operate nationwide or even globally. VC expectations can often vary. Some may want a quicker public sale of the company or expect fast growth. The amount of help a VC provides can vary from one firm to the next. Within the venture capital industry, the general partners and other investment professionals of the venture capital firm are often referred to as "venture capitalists" or "VCs". Typical career backgrounds vary, but, broadly speaking, venture capitalists come from either an operational or a finance background. Venture capitalists with an operational background (operating partner) tend to be former founders or executives of companies similar to those which the partnership finances or will have served as management consultants. Venture capitalists with finance backgrounds tend to have investment banking or other corporate finance experience. General Partners or GPs They run the Venture Capital firm and make the investment decisions on behalf of the fund. GPs typically put in personal capital up to 1-2% of the VC Fund size to show their commitment to the LPs. Venture partners Venture partners are expected to source potential investment opportunities ("bring in deals") and typically are compensated only for those deals with which they are involved. Principal This is a mid-level investment professional position, and often considered a "partner-track" position. Principals will have been promoted from a senior associate position or who have commensurate experience in another field, such as investment banking, management consulting, or a market of particular interest to the strategy of the venture capital firm. Associate This is typically the most junior apprentice position within a venture capital firm. After a few successful years, an associate may move up to the "senior associate" position and potentially principal and beyond. Associates will often have worked for 1–2 years in another field, such as investment banking or management consulting. Entrepreneur-in-residence Entrepreneurs-in-residence (EIRs) are experts in a particular industry sector (e.g., biotechnology or social media) and perform due diligence on potential deals. EIRs are hired by venture capital firms temporarily (six to 18 months) and are expected to develop and pitch startup ideas to their host firm, although neither party is bound to work with each other. Some EIRs move on to executive positions within a portfolio company. Most venture capital funds have a fixed life of 10 years, with the possibility of a few years of extensions to allow for private companies still seeking liquidity. The investing cycle for most funds is generally three to five years, after which the focus is managing and making follow-on investments in an existing portfolio. This model was pioneered by successful funds in Silicon Valley through the 1980s to invest in technological trends broadly but only during their period of ascendance, and to cut exposure to management and marketing risks of any individual firm or its product. In such a fund, the investors have a fixed commitment to the fund that is initially unfunded and subsequently "called down" by the venture capital fund over time as the fund makes its investments. There are substantial penalties for a limited partner (or investor) that fails to participate in a capital call. It can take anywhere from a month or so to several years for venture capitalists to raise money from limited partners for their fund. At the time when all of the money has been raised, the fund is said to be closed, and the 10-year lifetime begins. Some funds have partial closes when one half (or some other amount) of the fund has been raised. The vintage year generally refers to the year in which the fund was closed and may serve as a means to stratify VC funds for comparison. This shows the difference between a venture capital fund management company and the venture capital funds managed by them. From investors' point of view, funds can be: (1) traditional—where all the investors invest with equal terms; or (2) asymmetric—where different investors have different terms. Typically the asymmetry is seen in cases where there's an investor that has other interests such as tax income in case of public investors. Management fees an annual payment made by the investors in the fund to the fund's manager to pay for the private equity firm's investment operations. In a typical venture capital fund, the general partners receive an annual management fee equal to up to 2% of the committed capital. Carried interest a share of the profits of the fund (typically 20%), paid to the private equity fund's management company as a performance incentive. The remaining 80% of the profits are paid to the fund's investors Strong limited partner interest in top-tier venture firms has led to a general trend toward terms more favorable to the venture partnership, and certain groups are able to command carried interest of 25–30% on their funds. Because a fund may run out of capital prior to the end of its life, larger venture capital firms usually have several overlapping funds at the same time; doing so lets the larger firm keep specialists in all stages of the development of firms almost constantly engaged. 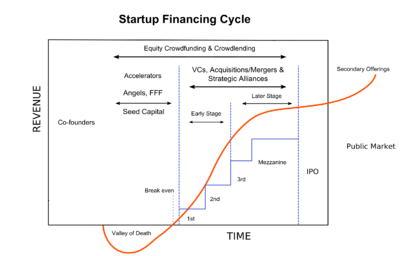 Smaller firms tend to thrive or fail with their initial industry contacts; by the time the fund cashes out, an entirely new generation of technologies and people is ascending, whom the general partners may not know well, and so it is prudent to reassess and shift industries or personnel rather than attempt to simply invest more in the industry or people the partners already know. Because of the strict requirements venture capitalists have for potential investments, many entrepreneurs seek seed funding from angel investors, who may be more willing to invest in highly speculative opportunities, or may have a prior relationship with the entrepreneur. Additionally, entrepreneurs may seek alternative financing, such as revenue-based financing, to avoid giving up equity ownership in the business. Furthermore, many venture capital firms will only seriously evaluate an investment in a start-up company otherwise unknown to them if the company can prove at least some of its claims about the technology and/or market potential for its product or services. To achieve this, or even just to avoid the dilutive effects of receiving funding before such claims are proven, many start-ups seek to self-finance sweat equity until they reach a point where they can credibly approach outside capital providers such as venture capitalists or angel investors. This practice is called "bootstrapping". Equity crowdfunding is emerging as an alternative to traditional venture capital. Traditional crowdfunding is an approach to raising the capital required for a new project or enterprise by appealing to large numbers of ordinary people for small donations. While such an approach has long precedents in the sphere of charity, it is receiving renewed attention from entrepreneurs, now that social media and online communities make it possible to reach out to a group of potentially interested supporters at very low cost. Some equity crowdfunding models are also being applied specifically for startup funding, such as those listed at Comparison of crowd funding services. One of the reasons to look for alternatives to venture capital is the problem of the traditional VC model. The traditional VCs are shifting their focus to later-stage investments, and return on investment of many VC funds have been low or negative. In Europe and India, Media for equity is a partial alternative to venture capital funding. Media for equity investors are able to supply start-ups with often significant advertising campaigns in return for equity. In Europe, an investment advisory firm offers young ventures the option to exchange equity for services investment; their aim is to guide ventures through the development stage to arrive at a significant funding, mergers and acquisition, or other exit strategy. In industries where assets can be securitized effectively because they reliably generate future revenue streams or have a good potential for resale in case of foreclosure, businesses may more cheaply be able to raise debt to finance their growth. Good examples would include asset-intensive extractive industries such as mining, or manufacturing industries. Offshore funding is provided via specialist venture capital trusts, which seek to use securitization in structuring hybrid multi-market transactions via an SPV (special purpose vehicle): a corporate entity that is designed solely for the purpose of the financing. In addition to traditional venture capital and angel networks, groups have emerged, which allow groups of small investors or entrepreneurs themselves to compete in a privatized business plan competition where the group itself serves as the investor through a democratic process. Law firms are also increasingly acting as an intermediary between clients seeking venture capital and the firms providing it. Other forms include venture resources that seek to provide non-monetary support to launch a new venture. Venture capital is also associated with job creation (accounting for 2% of US GDP), the knowledge economy, and used as a proxy measure of innovation within an economic sector or geography. Every year, there are nearly 2 million businesses created in the US, and 600–800 get venture capital funding. According to the National Venture Capital Association, 11% of private sector jobs come from venture-backed companies and venture-backed revenue accounts for 21% of US GDP. Babson College's Diana Report found that the number of women partners in VC firms decreased from 10% in 1999 to 6% in 2014. The report also found that 97% of VC-funded businesses had male chief executives, and that businesses with all-male teams were more than four times as likely to receive VC funding compared to teams with at least one woman. Currently, about 3 percent of all venture capital is going to woman-led companies. More than 75% of VC firms in the US did not have any female venture capitalists at the time they were surveyed. It was found that a greater fraction of VC firms had never had a woman represent them on the board of one of their portfolio companies. In 2017 only 2.2% of all VC funding went to female founders. For comparison, a UC Davis study focusing on large public companies in California found 49.5% with at least one female board seat. When the latter results were published, some San Jose Mercury News readers dismissed the possibility that sexism was a cause. In a follow-up Newsweek article, Nina Burleigh asked "Where were all these offended people when women like Heidi Roizen published accounts of having a venture capitalist stick her hand in his pants under a table while a deal was being discussed?" Venture capital, as an industry, originated in the United States, and American firms have traditionally been the largest participants in venture deals with the bulk of venture capital being deployed in American companies. However, increasingly, non-US venture investment is growing, and the number and size of non-US venture capitalists have been expanding. Venture capital has been used as a tool for economic development in a variety of developing regions. In many of these regions, with less developed financial sectors, venture capital plays a role in facilitating access to finance for small and medium enterprises (SMEs), which in most cases would not qualify for receiving bank loans. In the year of 2008, while VC funding were still majorly dominated by U.S. money ($28.8 billion invested in over 2550 deals in 2008), compared to international fund investments ($13.4 billion invested elsewhere), there has been an average 5% growth in the venture capital deals outside the US, mainly in China and Europe. Geographical differences can be significant. For instance, in the UK, 4% of British investment goes to venture capital, compared to about 33% in the U.S.
Venture capitalists invested some $29.1 billion in 3,752 deals in the U.S. through the fourth quarter of 2011, according to a report by the National Venture Capital Association. The same numbers for all of 2010 were $23.4 billion in 3,496 deals. According to a report by Dow Jones VentureSource, venture capital funding fell to $6.4 billion in the US in the first quarter of 2013, an 11.8% drop from the first quarter of 2012, and a 20.8% decline from 2011. Venture firms have added $4.2 billion into their funds this year, down from $6.3 billion in the first quarter of 2013, but up from $2.6 billion in the fourth quarter of 2012. The Venture Capital industry in Mexico is a fast-growing sector in the country that, with the support of institutions and private funds, is estimated to reach US$100 billion invested by 2018. In Israel, high-tech entrepreneurship and venture capital have flourished well beyond the country's relative size. As it has very little natural resources and, historically has been forced to build its economy on knowledge-based industries, its VC industry has rapidly developed, and nowadays has about 70 active venture capital funds, of which 14 international VCs with Israeli offices, and additional 220 international funds which actively invest in Israel. In addition, as of 2010, Israel led the world in venture capital invested per capita. Israel attracted $170 per person compared to $75 in the USA. About two thirds of the funds invested were from foreign sources, and the rest domestic. In 2013, Wix.com joined 62 other Israeli firms on the Nasdaq. Read more about Venture capital in Israel. Canadian technology companies have attracted interest from the global venture capital community partially as a result of generous tax incentive through the Scientific Research and Experimental Development (SR&ED) investment tax credit program. The basic incentive available to any Canadian corporation performing R&D is a refundable tax credit that is equal to 20% of "qualifying" R&D expenditures (labour, material, R&D contracts, and R&D equipment). An enhanced 35% refundable tax credit of available to certain (i.e. small) Canadian-controlled private corporations (CCPCs). Because the CCPC rules require a minimum of 50% Canadian ownership in the company performing R&D, foreign investors who would like to benefit from the larger 35% tax credit must accept minority position in the company, which might not be desirable. The SR&ED program does not restrict the export of any technology or intellectual property that may have been developed with the benefit of SR&ED tax incentives. Canada also has a fairly unusual form of venture capital generation in its Labour Sponsored Venture Capital Corporations (LSVCC). These funds, also known as Retail Venture Capital or Labour Sponsored Investment Funds (LSIF), are generally sponsored by labor unions and offer tax breaks from government to encourage retail investors to purchase the funds. Generally, these Retail Venture Capital funds only invest in companies where the majority of employees are in Canada. However, innovative structures have been developed to permit LSVCCs to direct in Canadian subsidiaries of corporations incorporated in jurisdictions outside of Canada. Many Swiss start-ups are university spin-offs, in particular from its federal institutes of technology in Lausanne and Zurich. According to a study by the London School of Economics analysing 130 ETH Zurich spin-offs over 10 years, about 90% of these start-ups survived the first five critical years, resulting in an average annual IRR of more than 43%. Switzerland's most active early-stage investors are The Zurich Cantonal Bank, investiere.ch, Swiss Founders Fund, as well as a number of angel investor clubs. Europe has a large and growing number of active venture firms. Capital raised in the region in 2005, including buy-out funds, exceeded €60 billion, of which €12.6 billion was specifically allocated to venture investment. Trade association Invest Europe has a list of active member firms and industry statistics. European venture capital investments in 2015 increased by 5% year-on-year to €3.8 billion, with 2,836 companies backed. The amount invested increased across all stages led by seed investments with an increase of 18%. Most capital was concentrated in life sciences (34%), computer & consumer electronics (20%) and communications (19%) sectors, according to Invest Europe's annual data. In 2012, in France, according to a study  by AFIC (the French Association of VC firms), €6.1B have been invested through 1,548 deals (39% in new companies, 61% in new rounds) by firms such as Partech Ventures or Innovacom. A study published in early 2013 showed that contrary to popular belief, European startups backed by venture capital do not perform worse than US counterparts. European venture-backed firms have an equal chance of listing on the stock exchange, and a slightly lower chance of a "trade sale" (acquisition by other company). Leading early-stage venture capital investors in Europe include Mark Tluszcz of Mangrove Capital Partners and Danny Rimer of Index Ventures, both of whom were named on Forbes Magazine's Midas List of the world's top dealmakers in technology venture capital in 2007. India is fast catching up with the West in the field of venture capital and a number of venture capital funds have a presence in the country (IVCA). In 2006, the total amount of private equity and venture capital in India reached $7.5 billion across 299 deals. In the Indian context, venture capital consists of investing in equity, quasi-equity, or conditional loans in order to promote unlisted, high-risk, or high-tech firms driven by technically or professionally qualified entrepreneurs. It is also used to refer to investors "providing seed", "start-up and first-stage financing", or financing companies that have demonstrated extraordinary business potential. Venture capital refers to capital investment; equity and debt ;both of which carry indubitable risk. The risk anticipated is very high. The venture capital industry follows the concept of "high risk, high return", innovative entrepreneurship, knowledge-based ideas and human capital intensive enterprises have taken the front seat as venture capitalists invest in risky finance to encourage innovation. China is also starting to develop a venture capital industry (CVCA). Singapore is widely recognized and featured as one of the hottest places to both start up and invest, mainly due to its healthy ecosystem, its strategic location and connectedness to foreign markets. With 100 deals valued at US$3.5 billion, Singapore saw a record value of PE and VC investments in 2016. The number of PE and VC investments increased substantially over the last 5 years: In 2015, Singapore recorded 81 investments with an aggregate value of US$2.2 billion while in 2014 and 2013, PE and VC deal values came to US$2.4 billion and US$0.9 billion respectively. With 53 percent, tech investments account for the majority of deal volume. Moreover, Singapore is home to two of South-East Asia's largest unicorns. Garena is reportedly the highest-valued unicorn in the region with a US$3.5 billion price tag, while Grab is the highest-funded, having raised a total of US$1.43 billion since its incorporation in 2012. Start-ups and small businesses in Singapore receive support from policy makers and the local government fosters the role VCs play to support entrepreneurship in Singapore and the region. For instance, in 2016, Singapore's National Research Foundation (NRF) has given out grants up to around $30 million to four large local enterprises for investments in startups in the city-state. This first of its kind partnership NRF has entered into is designed to encourage these enterprises to source for new technologies and innovative business models. Currently, the rules governing VC firms are being reviewed by the Monetary Authority of Singapore (MAS) to make it easier to set up funds and increase funding opportunities for start-ups. This mainly includes simplifying and shortening the authorization process for new venture capital managers and to study whether existing incentives that have attracted traditional asset managers here will be suitable for the VC sector. A public consultation on the proposals was held in January 2017 with changes expected to be introduced by July. The Middle East and North Africa (MENA) venture capital industry is an early stage of development but growing. The MENA Private Equity Association [permanent dead link] Guide to Venture Capital for entrepreneurs lists VC firms in the region, and other resources available in the MENA VC ecosystem. Diaspora organization TechWadi aims to give MENA companies access to VC investors based in the US. Currently, there are not many venture capital funds in operation and it is a small community; however the number of venture funds are steadily increasing with new incentives slowly coming in from government. Funds are difficult to come by and due to the limited funding, companies are more likely to receive funding if they can demonstrate initial sales or traction and the potential for significant growth. The majority of the venture capital in Sub-Saharan Africa is centered on South Africa and Kenya. Unlike public companies, information regarding an entrepreneur's business is typically confidential and proprietary. As part of the due diligence process, most venture capitalists will require significant detail with respect to a company's business plan. Entrepreneurs must remain vigilant about sharing information with venture capitalists that are investors in their competitors. Most venture capitalists treat information confidentially, but as a matter of business practice, they do not typically enter into Non Disclosure Agreements because of the potential liability issues those agreements entail. Entrepreneurs are typically well advised to protect truly proprietary intellectual property. Limited partners of venture capital firms typically have access only to limited amounts of information with respect to the individual portfolio companies in which they are invested and are typically bound by confidentiality provisions in the fund's limited partnership agreement. There are several strict guidelines regulating those that deal in venture capital. Namely, they are not allowed to advertise or solicit business in any form as per the U.S. Securities and Exchange Commission guidelines. Mark Coggins' novel Vulture Capital (2002) features a venture capitalist protagonist who investigates the disappearance of the chief scientist in a biotech firm in which he has invested. Coggins also worked in the industry and was co-founder of a dot-com startup. Drawing on his experience as reporter covering technology for the New York Times, Matt Richtel produced the novel Hooked (2007), in which the actions of the main character's deceased girlfriend, a Silicon Valley venture capitalist, play a key role in the plot. Great, detailed work on VC method of funding. In the Dilbert comic strip, a character named "Vijay, the World's Most Desperate Venture Capitalist" frequently makes appearances, offering bags of cash to anyone with even a hint of potential. In one strip, he offers two small children with good math grades money based on the fact that if they marry and produce an engineer baby he can invest in the infant's first idea. The children respond that they are already looking for mezzanine funding. Robert von Goeben and Kathryn Siegler produced a comic strip called The VC between the years 1997 and 2000 that parodied the industry, often by showing humorous exchanges between venture capitalists and entrepreneurs. Von Goeben was a partner in Redleaf Venture Management when he began writing the strip. In Wedding Crashers (2005), Jeremy Grey (Vince Vaughn) and John Beckwith (Owen Wilson) are bachelors who create appearances to play at different weddings of complete strangers, and a large part of the movie follows them posing as venture capitalists from New Hampshire. The documentary Something Ventured (2011) chronicled the recent history of American technology venture capitalists. In the TV series Dragons' Den, various startup companies pitch their business plans to a panel of venture capitalists. In the ABC reality television show Shark Tank, venture capitalists ("Sharks") hear entrepreneurs' pitches and select which ones they will invest in. The short-lived Bravo reality TV show Start-Ups: Silicon Valley had participation from venture capitalists in Silicon Valley. The sitcom Silicon Valley parodies startup companies and venture capital culture. ^ In 1971, a series of articles entitled "Silicon Valley USA" were published in the Electronic News, a weekly trade publication, giving rise to the use of the term Silicon Valley. ^ The "prudent man rule" is a fiduciary responsibility of investment managers under ERISA. Under the original application, each investment was expected to adhere to risk standards on its own merits, limiting the ability of investment managers to make any investments deemed potentially risky. Under the revised 1978 interpretation, the concept of portfolio diversification of risk, measuring risk at the aggregate portfolio level rather than the investment level to satisfy fiduciary standards would also be accepted. ^ "Private Company Knowledge Bank". ^ Schmitt, Antje; Rosing, Kathrin; Zhang, Stephen X.; Leatherbee, Michael (2017-09-21). "A Dynamic Model of Entrepreneurial Uncertainty and Business Opportunity Identification: Exploration as a Mediator and Entrepreneurial Self-Efficacy as a Moderator". Entrepreneurship Theory and Practice. 42 (6): 835–859. doi:10.1177/1042258717721482. ISSN 1042-2587. ^ S.X. Zhang and J. Cueto (2015). "The Study of Bias in Entrepreneurship". Entrepreneurship Theory and Practice. 41 (3): 419–454. doi:10.1111/etap.12212. Archived from the original on December 8, 2015. ^ Wilson, John. The New Ventures, Inside the High Stakes World of Venture Capital. ^ Ante, Spencer E. (2008). Creative Capital: Georges Doriot and the Birth of Venture Capital. Cambridge, MA: Harvard Business School Press. ISBN 1-4221-0122-3. ^ Scott, Emlyn (March 6, 2017). "Emlyn Scott, "What Is Venture Capital?"". Capital Pitch. CapitalPitch.com. Archived from the original on March 18, 2017. Retrieved March 17, 2017. ^ Kirsner, Scott. "Venture capital's grandfather." The Boston Globe, April 6, 2008. ^ Lea, Charles. “Tape 4- Charles Lea”. Interview by Charles Rudnick. National Venture Capital Association Venture Capital Oral History Project Funded by Charles W. Newhall III. September 18, 2008. ^ "www.draperco.com". Archived from the original on October 2, 2011. ^ The Future of Securities Regulation speech by Brian G. Cartwright, General Counsel U.S. Securities and Exchange Commission Archived July 10, 2017, at the Wayback Machine. University of Pennsylvania Law School Institute for Law and Economics Philadelphia, Pennsylvania. October 24, 2007. ^ "Archived copy". Archived from the original on July 30, 2008. Retrieved July 30, 2008. CS1 maint: Archived copy as title (link) Official website of the National Venture Capital Association, the largest trade association for the venture capital industry. ^ a b c POLLACK, ANDREW. "Venture Capital Loses Its Vigor." New York Times, October 8, 1989. ^ Kurtzman, Joel. " PROSPECTS; Venture Capital." New York Times, March 27, 1988. ^ LUECK, THOMAS J. " High Tech's Glamour fades for some venture capitalists." New York Times, February 6, 1987. ^ "MoneyTree Survey". Pwcmoneytree.com. February 21, 2007. Archived from the original on June 14, 2007. Retrieved May 18, 2012. ^ Dow Jones Private Equity Analyst as referenced in Taub, Stephen. "Archived copy". Archived from the original on June 14, 2011. Retrieved June 8, 2008. CS1 maint: Archived copy as title (link) Record Year for Private Equity Fundraising. CFO.com, January 11, 2007. ^ "How Do Venture Capitalists Make Decisions?". Stanford University Graduate School of Business Research Paper. Archived from the original on July 4, 2017. Retrieved March 8, 2018. ^ Investment philosophy of VCs Archived June 12, 2008, at the Wayback Machine. ^ a b Cash-strapped entrepreneurs get creative, BBC News Archived May 21, 2010, at the Wayback Machine. ^ Corporate Finance, 8th Edition. Ross, Westerfield, Jaffe. McGraw-Hill publishing, 2008. ^ "Bootlaw – Essential law for startups and emerging tech businesses – Up, Up and Away. Should You be Thinking About Venture Debt?". Bootlaw.com. Archived from the original on April 20, 2012. Retrieved May 18, 2012. ^ Andreas Kuckertz (December 1, 2015). "The interplay of track record and trustworthiness in venture capital fundraising". ResearchGate. Archived from the original on September 27, 2015. ^ "Free database of venture capital funds". Creator.zoho.com. Retrieved May 18, 2012. ^ "Grow VC launches, aiming to become the Kiva for tech startups". Eu.techcrunch.com. February 15, 2010. Archived from the original on May 30, 2012. Retrieved May 18, 2012. ^ "Sollertis Strategy - Adventure Capitalist and Consulting Organisation". Sollertis Strategy - Adventure Capitalist and Consulting Organisation. Archived from the original on December 29, 2014. Retrieved December 29, 2014. ^ "Grow Venture Community". Growvc.com. Archived from the original on February 9, 2010. Retrieved May 18, 2012. ^ Austin, Scott (September 9, 2010). ""Law Firms Offer Discounts, Play Matchmaker," The Wall Street Journal, Sept. 9, 2010". Online.wsj.com. Archived from the original on January 15, 2015. Retrieved May 18, 2012. ^ "Venture Impact: The Economic Importance of Venture-Backed Companies to the U.S. Economy". National Venture Capital Association. Archived from the original on June 30, 2014. Retrieved May 18, 2012. ^ Venture Impact (5 ed.). IHS Global Insight. 2009. p. 2. ISBN 0-9785015-7-8. Archived from the original on June 30, 2014. ^ Brush, Candida (2014). "Diana Report" (PDF). Women Entrepreneurs 2014. Archived from the original (PDF) on January 22, 2016. Retrieved January 14, 2016. ^ Alba, Davey (March 20, 2015). "The gender problem in venture capital is really, really bad". Wired. Archived from the original on February 10, 2016. Retrieved January 15, 2016. ^ Zarya, Valentina (January 1, 2018). "emale Founders Got 2% of Venture Capital Dollars in 2017". Fortune Magazine. Archived from the original on March 1, 2018. Retrieved February 28, 2018. ^ Ellis, Katrina (2006). "UC Davis Study of California Women Business Leaders" (PDF). UC Regents. Archived (PDF) from the original on April 2, 2015. Retrieved March 25, 2015. ^ Tam, Ruth (January 30, 2015). "Artist behind Newsweek cover: it's not sexist, it depicts the ugliness of sexism". PBS NewsHour. Archived from the original on March 21, 2015. Retrieved March 21, 2015. ^ Burleigh, Nina (January 28, 2015). "What Silicon Valley Thinks of Women". Newsweek. Archived from the original on March 21, 2015. Retrieved March 21, 2015. ^ "International venture funding rose 5 percent in 2008". VentureBeat. February 18, 2009. Archived from the original on July 14, 2012. Retrieved May 18, 2012. ^ "Mandelson, Peter. "There is no Google, or Amazon, or Microsoft or Apple in the UK, Mandelson tells BVCA." BriskFox Financial News, March 11, 2009". Briskfox.com. Archived from the original on January 20, 2012. Retrieved May 18, 2012. ^ "Recent Stats & Studies". Nvca.org. March 31, 2012. Archived from the original on May 5, 2012. Retrieved May 18, 2012. ^ Hamilton, Walter (April 18, 2013). "Venture-capital funding drops sharply in Southern California". latimes.com. Archived from the original on June 16, 2013. Retrieved June 14, 2013. ^ "Se afianza en México industria de "venture capital" | EL EMPRESARIO" (in Spanish). Elempresario.mx. August 16, 2012. Archived from the original on May 12, 2013. Retrieved June 14, 2013. ^ Wagner, Steffen (June 20, 2011). "Bright sparks! A portrait of entrepreneurial Switzerland" (PDF). Swiss Business. Archived (PDF) from the original on May 2, 2013. Retrieved April 24, 2013. ^ Oskarsson, Ingvi; Schläpfer, Alexander (September 2008). "The performance of Spin-off companies at the Swiss Federal Institute of Technology Zurich" (PDF). ETH transfer. Archived from the original on February 2, 2014. Retrieved January 29, 2014. ^ "Most active Early Stage Investors in 2013". Startupticker.ch. March 21, 2014. Archived from the original on June 19, 2015. Retrieved June 19, 2015. ^ "Invest Europe - The Voice of Private Capital". www.investeurope.eu. Archived from the original on May 22, 2017. Retrieved May 5, 2017. ^ "Invest Europe 2015 European Private Equity Activity report" (PDF). Archived (PDF) from the original on July 5, 2016. ^ Erika Brown and Claire Cain Miller (February 2, 2007). "Technology's Top Dealmakers". Forbes. Archived from the original on August 7, 2017. ^ "Venture Capital & Private Equity in India (October 2007)" (PDF). Archived from the original (PDF) on January 11, 2012. Retrieved May 18, 2012. ^ "Venture Capital And Private Equity in India" (PDF). Archived from the original (PDF) on January 11, 2012. ^ "Venture Capital:An Impetus to Indian Economy" (PDF). Archived (PDF) from the original on November 24, 2011. ^ "Let's Open the 100 Million Dollar Door | IDG Ventures Vietnam – Official Website". IDG Venture Vietnam. Archived from the original on March 22, 2012. Retrieved May 18, 2012. ^ "4 Reasons Why Singapore Is a Global Hot Spot for Entrepreneurship". inc.com. October 15, 2015. Retrieved May 6, 2018. ^ Cheok, Jacquelyn. "Tech behind record PE, VC deals in 2016". businesstimes.com.sg. Archived from the original on October 12, 2017. Retrieved May 6, 2018. ^ "Singapore's NRF awards $30m to CapitaLand, DeClout, Wilmar, YCH to invest in local startups - DealStreetAsia". www.dealstreetasia.com. Archived from the original on August 13, 2016. Retrieved May 6, 2018. ^ "Eliminating the Prohibition Against General Solicitation and General Advertising in Rule 506 and Rule 144A Offerings". U.S. Securities and Exchange Commission. Archived from the original on September 25, 2014. Retrieved August 20, 2014. ^ Liedtke, Michael. "Salon.com, "How Greedy Was My Valley?"". Dir.salon.com. Archived from the original on May 31, 2010. Retrieved May 18, 2012. ^ Richtel, Matt. "National Public Radio, "Love, Loss and Digital-Age Deception in Hooke"". Npr.org. Archived from the original on July 12, 2012. Retrieved May 18, 2012. ^ Sahlman, William A.; Scherlis, Daniel R. (July 24, 1987). "A Method For Valuing High-Risk, Long-Term Investments: The "Venture Capital Method"". Archived from the original on March 31, 2018. Retrieved May 6, 2018 – via www.hbs.edu. ^ "The VC Comic Strip". Thevc.com. Archived from the original on April 11, 2012. Retrieved May 18, 2012. ^ "Comic Book Pokes Fun at Venture Capitalists". San Francisco Chronicle. December 20, 1999. Archived from the original on June 12, 2012. Retrieved May 18, 2012.